In 2015, WHEALBI has produced significant achievements in several ways. First of all, exome sequence of 512 barley and 512 wheat accessions covering the range of genetic diversity have been produced by partners TGAC and PTP. These raw data are currently being processed (cleaning, quality control, SNP calling) to be released to WHEALBI partners in early 2016. As an evidence of the value of these data, we already received request from several consortia to have access, which will be effective soon after first exploitation within WHEALBI. These 1024 accessions have also been planted in the field, at 7 locations for each species, spanning over Europe from Scotland to Turkey. This will allow a comprehensive study of adaptation to a wide range of climatic conditions, and exome data will give insights into its genetic components. In 2016, Exome polymorphism will also be “mined” to explore the genetic bases of key adaptive traits, and used in statistical models to improve genetic dissection breeding efficiency, as illustrated by the 1000 bulls genome project (http://www.1000bullgenomes.com/). A smaller collection of diverse barley and wheat varieties will also be studied in innovative, more sustainable cropping systems, including organic, to anticipate the needs of future European Agriculture. We wish you a successful 2016 year! WHEALBI has now started 2 years ago : where are we now? The main efforts during the first two years have been dedicated to the choice of lines, logistics and production of data (molecular and phenotypic). Below is an overview of the production of the 3 Work Packages (WP) dedicated to production. The panel of 512 barley and 512 wheat genotypes were compiled. All seeds were aliquoted and distributed on time for phenotypic exploitation (WP3) and agronomic trials (WP7). DNA was also extracted for WP2. At the 1st of January 2016, all 512 barley and 512 wheat accessions have been exome captured and sequenced by PTP and TGAC respectively. The average number of reads per accession was around 40 million for barley and 37 million for wheat. The raw reads have been distributed to the partners in WP2 for quality control, assembly and variant calling. The WP3 explores different phenotyping strategies to complement the sequence data generated in WP2. The first phenotyping step has been dedicated to the evaluation of the basic adaptive traits of the whole germplasm collection to identify loci controlling local adaptation in wheat and barley. This activity has been accomplished through the organization of a network of field trials (common garden experiments) across latitude (from Scotland to Turkey) and across different climatic conditions (from wet to extreme dry, from sea level to 1200 meters) where all WHEALBI accessions have been tested. Overall, 10 common garden experiments have been carried out for barley and 8 for wheat. The next annual meeting will be organized by CREA in Salsomaggiore Terme, between Milan and Bologna, about 20km from the CREA research center. The meeting is planned on 20-21 April 2016, following a training course on Phenotyping (see below) organized by CREA. The annual meeting will discuss internal issues to the project and is not open to the broad community. A summary on the advancement of the project and the discussions will be made available in the Newsletter 3 around June 2016. Both trainings have a limited number of attendees (resp. 30 and 24). Inscription will favour young researchers (Ph.Ds and post-doc) and private companies. Please register by sending an email to : contact@whealbi.eu. To communicate around WHEALBI project and show the importance of genetic resources for the future of agriculture, 5 European agriculture colleges and universities, coming from 5 different countries (Italy, France, UK, Germany and Hungary) will be involved in the dissemination of the project. They will be asked to conduct small trials to work and investigate, on a pedagogical way, this genetic diversity. These colleges will be all together in contact to discuss and analyse the observations they will make around the diversity of the same varieties cultivated in different locations and environments. Researchers from the project will participate, coordinate and teach in the project. This summit was the opportunity to bring together high-level representatives from the European institutions, industry, primary producers, civil society, the scientific community, representatives from regional public investment banks, private equity firms investing in the bioeconomy, members of the European Parliament and producers in the agricultural, forestry and marine sectors. A WHEALBI representative was present at this event hosted by the EU Commissioner for Research, Innovation and Science, Carlos Moedas. Many contacts were taken amongst the other EU-FP7 projects, initiatives and European Commission to advertise around the WHEALBI project and find possible communication approaches and synergies. Partners from the WHEALBI project participated to the "International Wheat Innovation Workshop" conference (iWiW) on 16 and 17 November 2015 in Clermont-Ferrand. This conference associated WISP wheat programs (UK LOLA project, http://www.wheatisp.org/), proWeizen (German research and breeding alliance, www.proweizen.de ), CRP Wheat (CGIAR challenge program, http://wheat.org/), the IWGSC (International Wheat Genome Sequencing Consortium, http://www.wheatgenome.org/ ) and the Wheat Initiative (http://www.wheatinitiative.org). 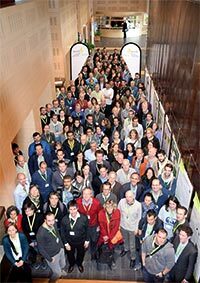 The aim of this wheat international conference was to inform the breeders and the scientific community on key advances in genomics, sequencing, genetics, ecophysiology and characterization of genetic resources of wheat, and to create links between projects. Members and teams working within the mentioned projects presented their results in four sessions consisting of presentations and round tables. The sessions were: 1) Genomics and sequencing, 2) Characters of interest and modeling, 3) Pre-breeding, genetics and association studies and 4) Database management. The conference brought together nearly 170 participants, including 40% from the private sector, from 5 continents and 16 countries. The Wheat Initiative was created in 2011 following endorsement from the G20 Agriculture Ministries, to provide a framework to establish strategic research and organisation priorities for wheat research at the international level in both developed and developing countries. The Wheat Initiative fosters communication between the research community, funders and global policy makers, and aims at securing efficient and long-term investments to meet wheat research and development goals. The Wheat Initiative also initiates and supports activities through its Expert Working Groups and backs established international collaborations such as Whealbi, in the form of “Associated Programmes”. In July 2015, the Wheat Initiative launched its Strategic Research Agenda (SRA), a strategy document that identifies key research challenges, priorities and game-changers that will allow the efficient delivery of improved wheat varieties. The SRA builds on the Wheat Initiative Vision Document presented in May 2013.